Mrs. Yvonne Sylvia of Edgartown traveled with members of her family to John Hancock Hall in Boston on May 14. 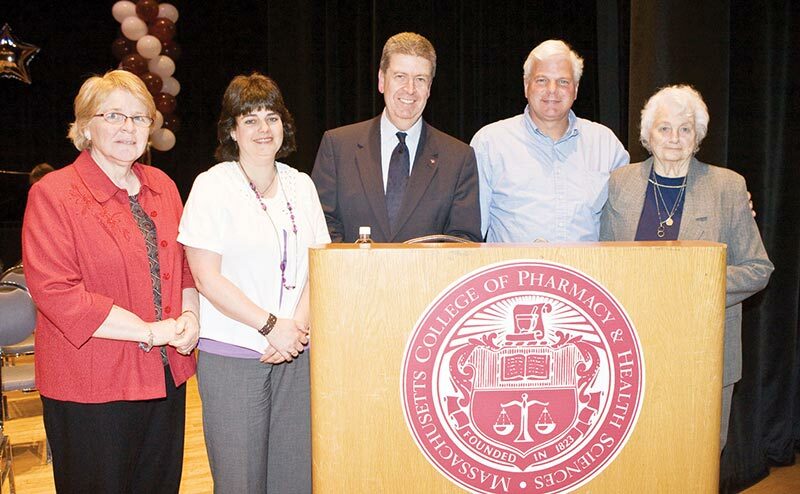 She was there at the invitation of the Massachusetts College of Pharmacy and Health Sciences to present the school’s World War II Memorial Scholarship, which honors the graduates of the school who lost their lives in the war. The story of her invitation began in 2006 at the school’s annual Hooding and Awards Ceremony, which recognizes sixth-year students for outstanding academic achievement. Sitting in the audience that day, Dennis G. Lyons, vice president for alumni and professional affairs, decided that the names of those World War II casualties who are memorialized by the scholarship should be known. In the 60 years since the war ended, records had been lost. After some diligent research, however, Mr. Lyons learned the identities of three: William J. Carroll (class of 1943), Francis G. Harris (’39) and Edmund Berube (’44) of Edgartown. In the course of his research, Mr. Lyons met Mrs. Sylvia and saw the scrapbook she had made in her brother Edmund’s memory. That scrapbook provided the material for a story about Mr. Berube, “An Alumnus to Honor,” published in the recent winter edition of the college publication, The Bulletin. Mr. Berube grew up in Edgartown, co-captained Edgartown High School’s championship basketball team and was president of his senior class. He worked at the Colonial Drug Store, owned by Len Henrickson. Just as in high school, Mr. Berube was very popular with his classmates and was elected president of his senior class. He expected to finish college and to return to Edgartown to work at the Colonial Drug Store. As the fighting on all the war’s fronts grew in intensity, there was a dire need for men with the type of medical training provided by the College of Pharmacy. In 1943, Mr. Berube and the 72 other members of the class of 1944 learned that there would be no break, but that they would attend classes and graduate on October 27 as what would be known as the “second class of 1943” as part of an accelerated war-time program. Lewis Lappas of Boston, valedictorian of the first class of 1943, described the disruption the war had created in the professional and personal plans of his classmates as part of his graduation oration delivered that February. “Tomorrow we leave this place, our collegiate home, and depart in many directions to enter the mad conflict that threatens the ruin of our beloved America,” he said, “an America that has made our education possible, an America that for us has a meaning not limited to a portion of the earth’s surface, but that rather symbolizes a kind of world, no matter what it might be named, in which ‘democracy’ and ‘freedom’ and ‘peace’ are not empty words. Like so many other young men and women of his generation, Mr. Berube postponed his future plans and answered the call of service. Two months after he received a bachelor of science degree in pharmacy, he joined the Navy. He spent the winter months at the U.S. Naval Training station in Samson, New York. In July, he completed his training with high marks and received the rank of pharmacist’s mate, second class. On August 14, 1944, he left San Diego as a Navy Corpsman assigned to the Third Marine Division. The battle for Iwo Jima began following a sustained bombardment that did little to weaken the Japanese defenses. The Fourth and Fifth Marine Divisions began landing on the southeast shore of the volcanic island on February 19, 1945. The Third Marine Division, which had been held in reserve, landed two days later. According to Navy records, in one division alone, casualties of hospital corpsmen in each of six battalions exceeded 50 percent. In four battalions, casualties exceeded 60 percent, and in one, they were in excess of 68 percent. Mr. Lyons called on the graduates and future pharmacists to take inspiration from Mr. Berube’s life, one of great potential and of sacrifice in the care of his patients. Mr. Lyons had invited Mrs. Sylvia to the school’s annual Hooding and Awards Ceremony after learning about the short, heroic life of Edmund Berube. The meaning of sacrifice was not lost on Yvonne Sylvia, who joined Mr. Lyons to present the award, recognizing the ultimate sacrifices of College of Pharmacy graduates, to David Tran of Malden. Following her brother’s death, Mrs. Sylvia’s ties to the college remained strong. Her son Edmund Berube Sylvia (who died in 2005 of cancer) attended the College of Pharmacy and met his future wife, Ellen Wheeler (class of 1975) there. Edmund Berube is buried in Edgartown cemetery next to members of his family. At the request of his mother, his body was returned from Iwo Jima, in April 1948. Memorial Day is set aside for the nation to honor men and women, ordinary people for the most part, who answered the call of duty and in doing so lost their lives. At a time when the word hero is too quickly attached to achievements of no great significance or sacrifice, the life and death of Edmund Berube of Edgartown stands in contrast to the casual practice.